Our story begins in 1950 in Minneapolis, Minnesota, when five brothers sat around a conference room table trying to build a plan for the future. This blog post first began life as a talk on our Inside Intercom world tour. You can watch a recording of the talk above and the slides are embedded below. If you want to continue reading just scroll down. They had each inherited an equal share of the family business, Dayton’s, a small department store chain established in 1902. Dayton’s was small, it was local, it was traditional. Their advertising was pretty low key and uninspiring. 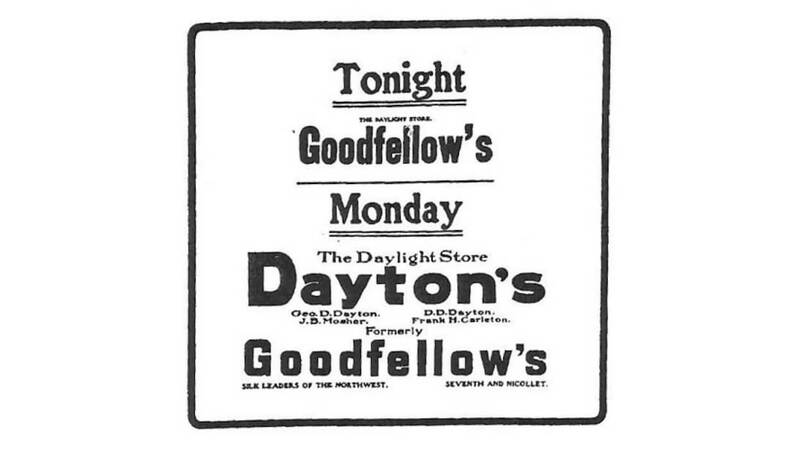 Their first print ad, published in 1903, has arguably the worst call to action ever: “Tonight Goodfellows, Monday, Dayton’s, formerly Goodfellow’s.” What are you supposed to do with that? It’s a really good example of just how small their thinking was. But the five brothers had big ambitions. They wanted to build a business that had a footprint across America, and potentially across the world, but they had a problem – Sears. At the time, Sears was the incumbent. They were 40 times the size of Dayton’s, had a huge footprint across America and were a household brand name. Sears was an intimidating opponent, but the brothers decided to go for it and hashed out a four point plan to compete. One of those points was an ambition to expand beyond their existing 10 locations into suburbia, where more of their customers were spending more of their time. At around the same time an Austrian, Victor Gruen, was thinking deeply about the same challenge – suburbia – but from a very different angle. Victor came to the US from Austria in 1938, and he quickly embedded himself in American life. He liked it, but he didn’t love it. 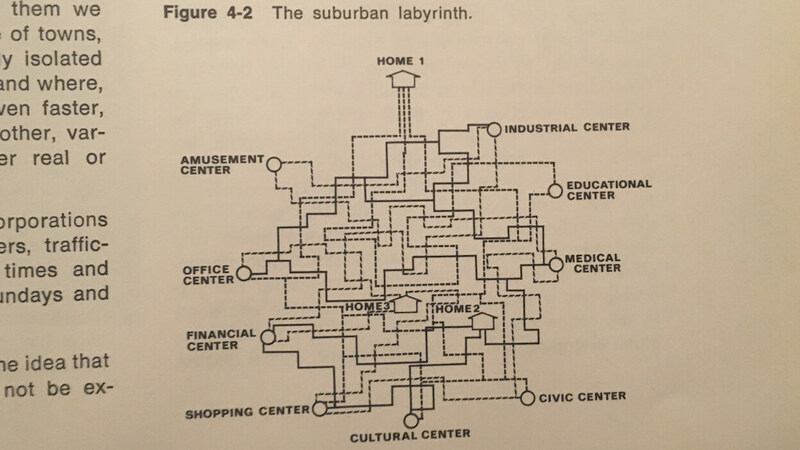 The biggest problem was suburbia, or as he called it, the suburban labyrinth. His solution enclosed all the services and stores that people might need. It frustrated him so much that he mapped it out. Gruen hated how cars, motorcycles and motorways had broken up the day-to-day lives of modern people. Suburbia was disconnected and impersonal. He missed the enclosed yet airy arcades of Europe. He felt suburban American was missing what Ray Oldenburg later called “a third place,” a place for people to connect and transact, so he designed a solution. He called it “the multifunctional center”, and it enclosed all the services and stores that people might need. This would be the new place for suburbanites to connect and transact. The Dayton family heard about Victor, reached out to him and formed a partnership. Victor set about designing the solution to his problems and Dayton’s problems – and in his view, America’s problems too. In 1956 together they launched the Southdale Center in Edina, Minnesota. It was the first fully enclosed, climate-controlled shopping center in history, and it defined how shopping centers are designed and built today. It was an overnight success – Dayton’s sales rose almost 60%. And the other stores in the mall flourished as well. It was the start of something way, way bigger. Today Dayton’s has evolved. It’s become Target corporation, a household name across the world. The battle with Sears had a clear winner. Today Target is a $40 billion business, while Sears is worth a pretty paltry $1.5 billion. Target’s logo is recognized by 96% of people in the US, which is amazing. 2004 was the year that Target last iterated on their logo, the bullseye. It was also the first time a young man named Mark Zuckerberg came into our lives. Mark started a little college website called thefacebook.com. It was an experiment, a side project, and he just wanted to connect college students on campus (we probably know why). It was super simple and super local. But he soon realized that he was onto something bigger. Engagement was off the charts; students were spending hours and hours of every single day on Facebook. He figured, okay, let’s scale this thing globally. Like Dayton’s, Zuck had a problem of his own. It wasn’t Sears; it was MySpace. At the time they were the incumbent, the big boys. It had a little bit of everything – blogs, videos, music, classifieds, etc. MySpace was the self-proclaimed “place for friends”. That’s a big, bold claim, but it was fair. 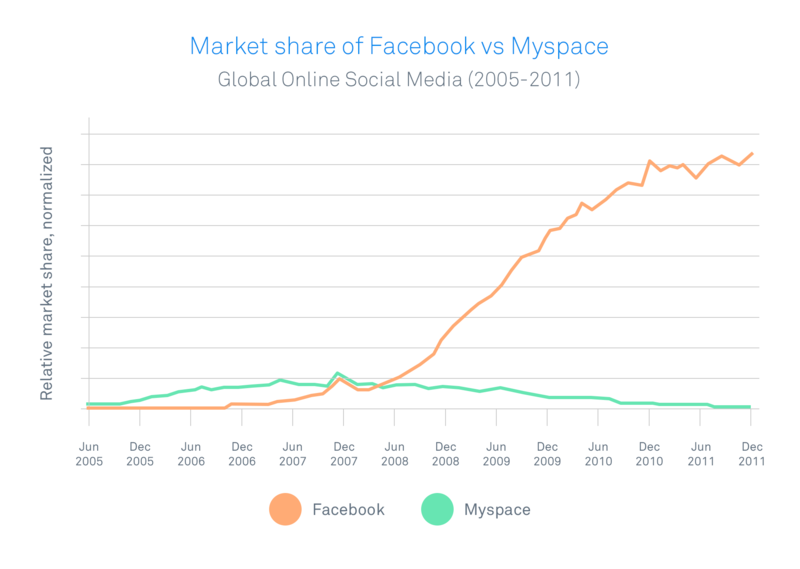 In 2006, 12% of all US time spent online was on MySpace. Facebook by comparison had a mere 1%. MySpace was winning. In 2006, Zuck and his team hatched together a plan to beat MySpace. At the very first F8 conference the following year, they launched Facebook platform. They offered deep integrations, mass distribution and a whole new opportunity to developers across the world. It worked. Less than two years later, the game was totally up for MySpace. Facebook’s growth accelerated and their trajectory changed forever. MySpace all but died. The graph above stops in 2011. Facebook have obviously grown way more since then. They are now a technology powerhouse, a family of apps including What’s App, Instagram and Oculus. It’s worth more than $330 billion. At its peak, MySpace was worth about $12 billion. These are two really different stories, two different companies operating at very different times, but they are actually really similar. Both changed their businesses from being product-focused, where they served one type of consumer, to becoming platforms that served many different types of consumers at once. 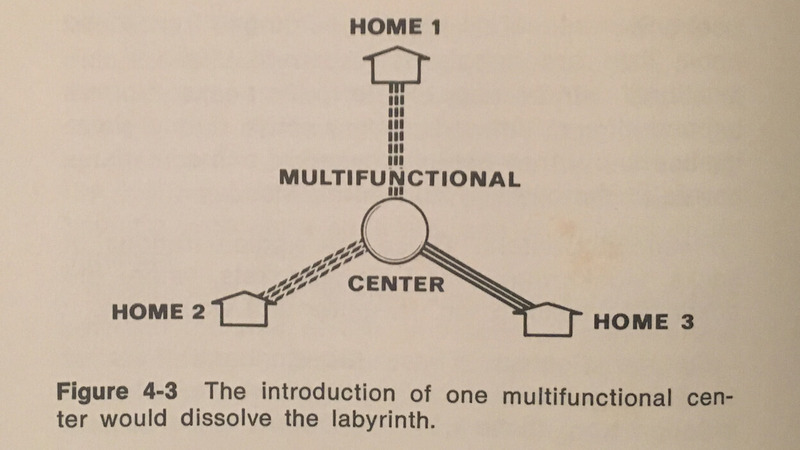 It’s interesting to look at a sketch from a book that Victor Gruen wrote many years ago. When he was designing shopping centers he didn’t just focus on the storefronts that customers walk through, he actually designed the layer of services that enable the stores to operate. The layer beneath, which powered the layer above. He actually used the word platform to describe it. Don’t forget, this was in the 1950’s, when “platform” in the technology context wasn’t even a thing. Facebook did the exact same thing. They launched a platform, they opened up their layer of services to developers, many developers built a lot of volume on top of them, and a lot of consumers were happy. It was a true platform play. Platforms succeed when they are truly open. The Victor Gruen take on this was parking. He actually spent a lot of time designing how cars were parked and designed the experience for the customer to get into the mall as quickly as possible. And the longer you spend in a shopping center, the more chance that you are going to spend money. Platforms succeed when they are truly open. Just like Gruen’s mall parking, Facebook was free. While social networks were charging up front for access, Facebook was free for anyone to join. It was actually free for developers too. The only tax for developers was their time. They didn’t have to pay for API access or SDKs. Both focused on this idea of anchored tenants. Dayton’s partnered up with Donaldson’s and Woolworths when they moved into new markets across America. Local brand names that would bring audiences and loyalty into their stores and into their malls. Facebook did the exact same thing when it launched Facebook platform. They didn’t just launch it alone, they launched it with Amazon, Washington Post and Microsoft. Each of them brought customers and content and loyalty, and they helped Facebook expand their reach across the globe. Both companies also focused on driving discovery. They knew there was no point in helping to build this value if people couldn’t discover it. Contextual discovery, the experience of discovering the right thing at the right time, doesn’t happen by accident. It’s actual well planned serendipity. 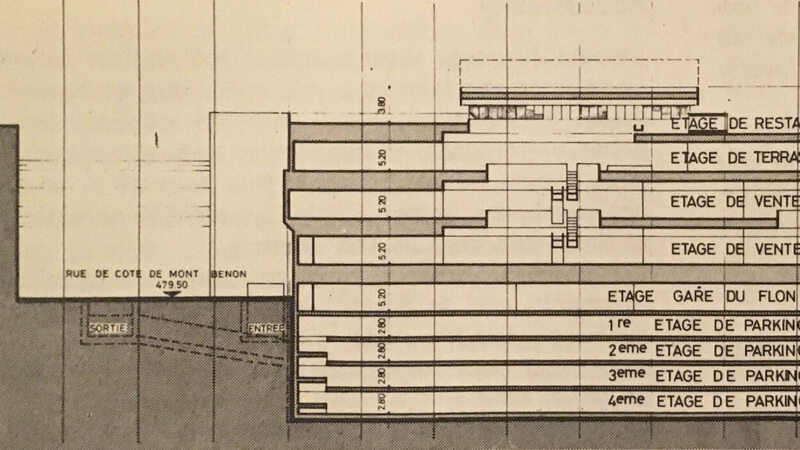 In designing shopping centers for Dayton’s, Victor Gruen designed from the inside out. He didn’t stop at designing parking lots and the mall itself; he actually designed the entire experience of getting there. Gruen spent a lot of time sketching urban transport maps, planning ways to bring customers close to the stores. Facebook’s version of this was Open Graph, which provided a way for developers to define the types of content users would interact with. They wanted to use that to drive people to the right content at the right time. They wanted people to find their relevant friends and groups quickly and easily. The similarity of thinking is uncanny. 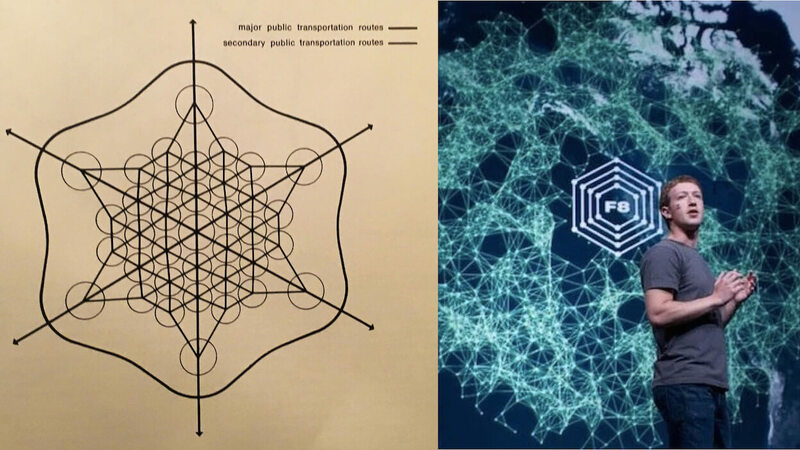 On the left side of the above image is another urban transport sketch from Victor Gruen. The right hand side is actually F8’s logo from a few years back. They actually look really similar. Designing friend connections actually isn’t all that different from designing urban transport routes. Dayton’s and Facebook – similar traits, similar stories. So what can software companies learn from shopping centers? Here are a few really simple things. Platforms aren’t about technology. Platforms in the software world are actually micro representations of the real world, micro economies, and economies are powered by people. When designing platforms, or designing a product for a platform, design experiences around people and behavior, not in isolation. Make sure the platform you are building or the platform you want to integrate with is truly open. There is a massive distinction between companies with freemium models and enterprise “buy before you try” software companies. Successful platforms fuel contextual discovery. The job isn’t done when platforms are designed, or when products are designed for platforms. Customers have specific needs that these niche products can meet, and developers want to make money from what they’ve built. Platforms never succeed without great partners. If you are building a platform, know your roadmap. Know what you are never going to build and offer up that opportunity to developers. If you are choosing a platform to integrate with, consider how complimentary your product is to that platform. Software platforms aren’t complicated. They work exactly the same way as the real world. If you want to see how they work, go to your local shopping center, grab a coffee, and observe. You never know what you might learn.